I’m running Windows 7 in a Boot Camp partition on my MacBook Pro. When I first configured Boot Camp I underestimated how much I’d use Windows and I’m now running out of space. How can I expand the size of the Boot Camp partition? Let’s start by taking a look at a couple of tools that provide the means to a larger partition. The easiest is Paragon’s $20 Camptune X (pictured above). 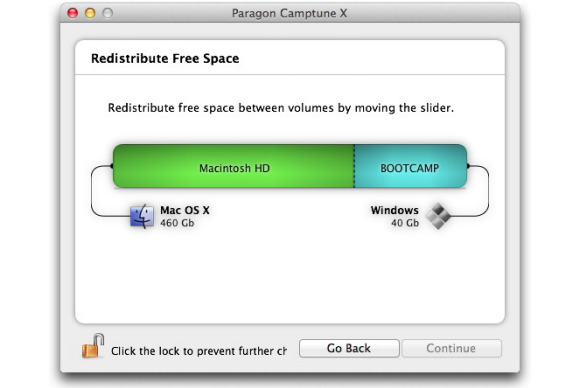 What makes it so easy is that you tell Camptune the size you’d like your partition to be and, provided there’s enough free space on your Mac partition to give up some for Boot Camp, it takes care of the rest. I ran it last week on my MacBook Pro’s Boot Camp partition and after 20 minutes or so, my partition was increased from 30 to 40GB. Easy though it may be, it’s always a good idea to have a backup of your Boot Camp partition before doing something like this. And for that backup the best tool around is Twocanoes’ $20 WinClone 3. Earlier versions of WinClone are not compatible with Apple’s latest operating system so while it may have been free once, it’s now something you must pungle up for. Those familiar with Winclone are aware that with its help you can create a larger Boot Camp partition without losing your original Windows data. The process involves creating an image of the partition for safe keeping, deleting the original Boot Camp partition with Disk Utility, creating a new, more expansive partition; and then moving the data from the imaged partition to the new one with WinClone. Twocanoes outlines the procedure in 25 steps. Each has its advantages. Camptune requires far less work, but if your Windows data isn’t backed up in some other way, you face the small risk of losing data if something goes wrong. The Winclone way is more involved, but it’s safer. If you have a Mac made in the last few years you’ll find running Windows under virtualization as pleasant an experience as Windows can provide—particularly if you devote more than one processor to it. It saves you from the bother of rebooting to use Windows and, of course, it’s completely cool to be able to copy files between your Mac and Windows environments.